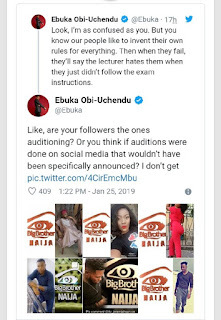 Media personality and Host of the Big Brother Naija Show, has reacted to pictures of 'aspiring contestants' putting their pictures side-by-side with the Big Brother Logo, soliciting for support when the Audition hasn't even started. Ebuka responded thus; "Like, are your followers the ones auditioning? Or you think if auditions were done on social media that wouldn't have been specifically announced? I don't get"Continuing he wrote; "In fact, you're probably even doing yourself more harm. A major element of Big Brother is secrecy and surprise but you think announcing your intentions on social media is a bright idea… Toh!" A user then replied; "They probably thinking if they even get voted in to the #BBNaija house. More followes = more votes." Then Ebuka responded; "If the organizers wanted people with followers on the show, they know exactly where to get them. More than half the housemates last season had less than 1000 Instagram followers on the day the show started."